As an added service, this product can be sewn into large custom panels for container fields, commercial composting, or other uses. Offered by the roll, or by the lineal foot. Quantity discounts available on 10,000+ SF. We fold and ship 10′+ widths to a maximum of 900 SF per package. 3′ – 6′ rolls are shipped via Fedex Ground. Larger rolls are shipped via freight for additional costs. Contact us for a freight quote by calling 1-800-811-7444 or contact us. 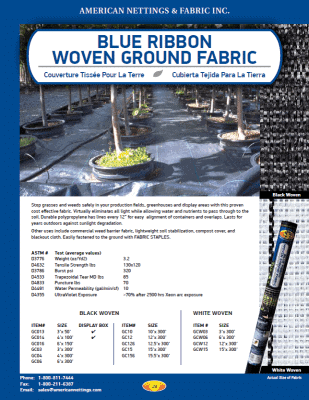 Please see Woven Landscape Fabric and/or Contractor Landscape Fabric for products with similar applications. For our retail sizes please see Woven Ground Cover. For discounted Woven Ground Cover, please see Woven Ground Cover Odds & Ends. Woven Ground Cover is an effective product for commercial growers. Proven to eliminate nearly all sunlight, Woven Ground Cover works wonders for grass and weed control. The blue lines have been provided to help maintain alignment for containers and overlaps. 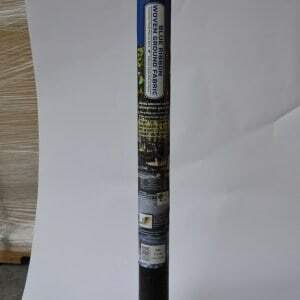 It is lightweight for easy installation. Do NOT cut with scissors as it can cause unraveling. Below are several common uses. Creating almost complete darkness wherever it is laid, Woven Ground Cover successfully controls weeds of all varieties. It also aids in organic growing, eliminating the need for harmful chemicals to eradicate weeds. Simply align the blue lines as desired and pin down. We recommend using Fabric Staples & Pins for securing fabric to the ground. Woven Ground Cover can be used to maintain soil temperature. With Woven Ground Cover, the growing season can start sooner and last longer! For installation, simply cut “X’s” where you want to plant using a hot knife to prevent unraveling. For more detailed instructions please see any of our Landscape Fabric products. Woven Ground Cover can be used as a lightweight soil stabilizer. 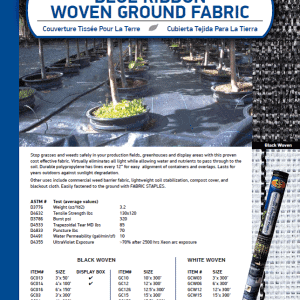 Please see Garden Netting, Woven Landscape Fabric and/or Contractor Landscape Fabric for products with similar applications. 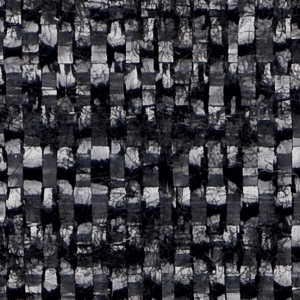 For any purpose necessitating complete darkness, Woven Ground Cover is ideal. It can be hung as well as used as ground cover. Working as both a light barrier and insulator, Woven Ground Cover is perfect for covering compost. 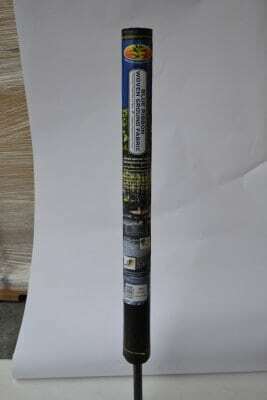 It ensures that no unwanted weeds, seeds or other invaders contaminate compost. *Cutting may cause unraveling or split edges. 3', 4', 5', 6', 10', 12', 12'6", 15', 15'6"